Backing tracks are already finished and we're now at the overdub stage (or "the colouring-in"). We have song titles too, but we'll wait just a little longer before announcing those. 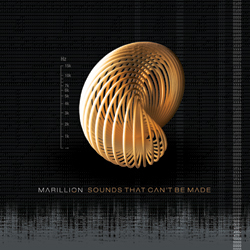 We are planning to create exclusive Special Editions of ’Sounds That Can’t Be Made’ which we'll be making available as a PRE-ORDER directly from us through marillion.com. This version will include 128 pages of artwork & lyrics presented in a deluxe hard back book. This collectors edition will also contain an extra DVD disc featuring interviews with the band and a selection of tracks performed live at the Racket Club; all filmed during various stages of the making of the album. This version will be a 1CD Jewel case version of the album containing song lyrics & condensed album artwork. When will it be released? What will be on it? When can I order? Just like previous pre-orders, we have set up this page to answer all of these questions, and will continue to add to the list as we receive feedback from you by email and on our Forum/Facebook pages. What we CAN tell you though, is that we expect the album to be ready sometime before September 2012 (we can't set a firm release date as our creative process doesn't always run to a timetable..) with an extensive tour planned throughout 2012 and into 2013. All the tour dates have now been announced and are up on the marillion.com TOUR section. We have also announced the 2013 dates for our bi-annual Marillion Weekends in Holland, Montreal and the UK! See www.marillionweekend.com for more details. Phew! We hope we'll see a lot of each other over the coming months. Sound-check/ front row passes to the 'Sounds That Can’t Be Made' tour, Meet-and-greets, Signed artwork, Your own private Marillion gig PLUS more as we think of them! *PLEASE NOTE: The 5000th pre-order was order number 509528. If your order number is higher than this then unfortunately your name WILL NOT be in the credits, BUT you will of course still be entered in to the fabulous prize draw competitions. By being part of the ’Sounds That Can’t be Made’ Pre-Order Campaign you will once again be acting as our "Record Company" by contributing to the recording, manufacture and marketing of the album. We'd rather make this album with you. We did it before and it was great. When we skipped the pre-order for Somewhere Else we know that many of you felt disappointed that you weren’t part of the ‘whole process’. So it's no longer about the money, it's about the taking-part and a show of faith. This, frankly, blows our minds, and your support means more to us now than ever. We meet so many bands who are envious of our amazing family around the world and we certainly don't take this for granted. We now find ourselves famous for the "Marillion business model" which is a scream, really, because the term debases what's really going on. We thank you all for being a part of this thing in the past; just as we gratefully acknowledge everyone who will preorder this forthcoming album. So there you go - the new pre-order! If you have any QUESTIONS, please, PLEASE have a look at the information on this page before writing to us - it'll be quicker. You can also join the discussions on the Marillion Online Forums (which we constantly monitor) if you have any outstanding queries. We're very excited about this album - it's taken us some years to ensure it's something special. We hope over the next few weeks and months to thank you for your loyalty - we will try and keep updating you regularly with updates from the studio, both by email and in our new Racket TV Lounge on the new and fabulous marillion.com website! It won't be long, yeah.. When do I need to pay for it? What do I get in the Deluxe CD Edition? When will ’Sounds That Can’t be Made’ be released? The honest answer is "We don't know"! Based on how the recording sessions are going, we expect the album to be with you in September at the latest. We WILL have the album out in 2012. When and how can I pre-order ’Sounds That Can’t be Made’? Payment will be taken at the same time as you place your pre-order, and NOT at a point in the future when Sounds That Can’t Be Made is released. What do I get in the Deluxe Campaign Collectors CD Edition? The Deluxe Campaign Edition is a 128-page hard-bound full-colour book, including a CD packed into a hard slip cover featuring the album artwork. There will also be a multi-region NTSC DVD which will include interviews with the band and a selection of tracks performed live at the Racket Club; All filmed during various stages of the making of the album. Can I get extra names listed in the album credits? We only allow 1 name in the credits per Deluxe Campaign CD Edition purchased. If you want an additional name listed in the credits as well, you will have to purchase an additional copy for each additional name. The names list will be generated from the "Ship To" portion of your order and NOT the "Bill To" portion, allowing you the ability to purchase multiple copies and specify separate names. We would prefer that you submit a separate order for each name required. ** If you DO NOT want your name listed in the album credits, please contact us no later than 1st June 2012 with your order number and we will arrange for it to be removed. You can pre-order until we announce a firm release date. Please note: the deadline for the Prize Draws has now passed. All the winners have now been chosen & contacted. You can still pre-order the Album right up until the release date but you will not be eligable for any of the prizes listed below. Each pre-order for the Sounds That Can’t Be Made Deluxe Campaign CD Edition will automatically enter you into prize draws for each of the eligible prizes listed below. Several of these prizes have cut-off deadlines - orders must be received by midnight local time (as noted on your order confirmation) on the date listed. Pre-orders placed after these deadline dates will NOT be entered for that particular prize draw. A Marillion lyric of your choice hand-written by Steve Hogarth and signed by all 5 band members. Broadcast via www.stageit.com (or similar) – an acoustic gig broadcast to anyone in the world – especially for you and up to 10 friends. Your name listed in Special Thanks section from the band. A one-off 12"x12" print of the Sounds That Can’t Be Made cover, signed by all 5 band members. Have a chat with Marillion! Each band member will select a winner, and give you a phone call to talk about whatever you'd like. Admission for 2 to the sound check at any choice of gig on Sounds That Can’t be Made tour (2 tickets included), plus passes to remain in the venue and/or early admission passes to guarantee yourself a front-row view of the gig. A pair of Ian Mosley's drum sticks, plus plectrums from Steve Rothery, Pete Trewavas and Steve Hogarth - all used for a Marillion show. A personalised video message posted to your Facebook wall. If you’re not on Facebook then we will upload it to YouTube for you. -Marillion/Racket Records' decision is final and no correspondence will be entered into. - All winners will be contacted by email as provided in their Marillion Online Account with details of how to claim their prize. - Marillion/Racket Records shall not be liable if, for any reason outside its control, any part of the chosen prize package becomes unavailable. - Marillion/Racket Records takes no responsibility for incomplete, illegible, lost, misdirected or late orders/entries. - If Marillion/Racket Records is unable to contact any winner within a period of 2 weeks following the draw date, having made reasonable efforts to do so, Marillion/Racket Records reserves the right in its absolute discretion to re-draw from the remaining eligible entries and select another winning participant. - Marillion/Racket Records reserves the right to verify the validity of all orders/entries. Marillion/Racket Records reserves the right to disqualify any entrant for tampering with the ordering/ entry process or attempting to act in a fraudulent or otherwise dishonest manner. - Marillion/Racket Records shall not be liable for any loss or damage suffered (including but not limited to indirect or consequential loss), or for any injury suffered or sustained or liability or costs incurred, as a result of accepting or using any prize, except for any liability that cannot be excluded by law. Marillion/Racket Records is not liable for any tax implications that may arise as a result of winning any prize. Prize values are given as at the commencement date of the promotions. - Marillion/Racket Records reserves the right to substitute any of the prizes with that of similar value at any time without prior notice and all prizes are non transferable or exchangeable. - Marillion/Racket Records will hold and may use personal information accompanying any entries for purposes relating to the promotion and for sending entrants promotional and other material in relation to future offers, information and activities of the Promoter, unless otherwise advised by the entrant at the time of entry. All entrants have the right to inspect and update their personal information at any time. - Winners agree to be available for reasonable publicity purposes without compensation including, but not limited to, photographs and interviews. Copyright will vest in Marillion/Racket Records. Winners acknowledge that their personal details may be published in print media and on the internet. ** Every effort will be made to add the correct names to the book credits but Marillion/Racket Records will not be held responsible for typographic errors, spelling mistakes or accidental omissions. No compensation, financial or otherwise, will be provided in the event that a customer's name does not appear in the album credits as he/she intends.